LightningPaul (Homepage) wrote: Superb image! The shadows, toning, part of the sun... all great. The composition is spot on. Tom (Homepage) wrote: Great shot, Paolo. Looks other-worldly. Michael Rawluk (Homepage) wrote: That is a stunning shot. The best winter shot of the winter. Asgardr (Homepage) wrote: I won't repeat my last comment but it comes down to the same commentary; Great photo! oldshutterhand (Homepage) wrote: Like frozen dancers, well done! Frida (Homepage) wrote: Love the long shadows and the framing is super. Marie (Homepage) wrote: splendide !!! j'aime bcp ces rayons de soleil à gauche. tom (Homepage) wrote: Stunning shot. I love the long shadows on the snow. Laurie (Homepage) wrote: I love the strong shadows and gentle curves here. This is beautiful. Marcie (Homepage) wrote: Stunning landscape..and so icey cold!!! Arjan - PlasticDaisy (Homepage) wrote: Fine work! Great tall shadows on this snowy hill! grant (Homepage) wrote: great shadows and light. Sabine (foKuspoint) (Homepage) wrote: Wow, just stunning. 613photo (Homepage) wrote: That is some perfect light. Awesome, long shadows cast from the trees. You can see every little bump in the snow. I also like how you can just see a little bit of the sun on the left side of the frame. Beautiful work. Andrés (Homepage) wrote: Superb lights, tones and framing!!! 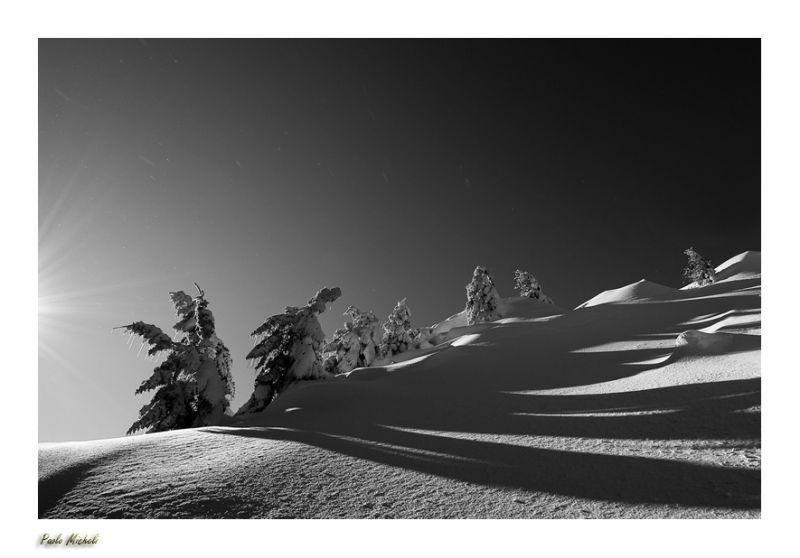 Wilfried (Homepage) wrote: Superb composition, i like this shadows on snow, and great b&w! gavin hart (Homepage) wrote: Magnificent black & white image Paolo! It's so clean and crisp. The light is catching beautifully on the snow sculpturing its forms.The tonal gradient in the sky is quite stunning too. I also like the inclusion of the radiating beams from the sun on the left. martie (Homepage) wrote: Talk about some amazing shadows! This is a great photo - and the perfect conversion.